Minecraft’s native LAN support is great for running games on the fly, but if you want a dedicated, customized server, Spigot is the way to go. 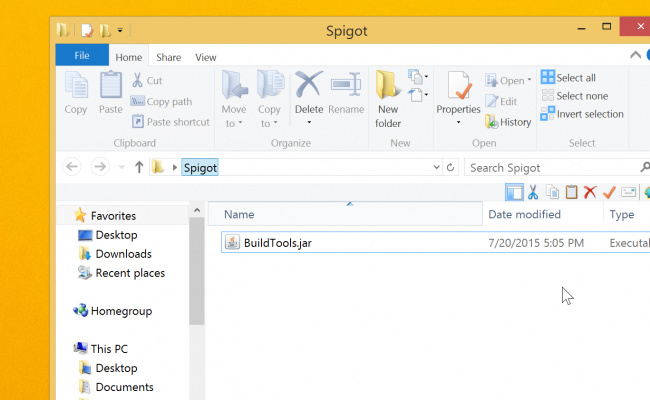 Spigot is built on a plugin API called Bukkit, which makes customizing your gameplay easy, and since the Bukkit project has been around since the dawn of Minecraft multiplayer, many developers have released their own plugins and modifications. Spigot is a modified fork of the Bukkit API, which is itself a modified fork of the official Minecraft server released by Mojang. Bukkit was born when developers and modders were dissatisfied with the closed source and lack of features in the official server, and wanted a more modular and customizable server solution. The actual implementation of the Bukkit API was called CraftBukkit, and as Minecraft grew, CraftBukkit grew to be the best choice for medium and large sized servers. Due to some legal troubles, the CraftBukkit project was shut down, and has not been updated to 1.8, the newest Minecraft version. This is where Spigot comes into play. Spigot was designed to make CraftBukkit faster and more efficient. It uses the Bukkit API, so all plugins compatible with Bukkit are compatible with Spigot. When the Bukkit downloads were taken down, the Spigot project continued to update the software, making it now the biggest choice for modded servers and the only choice for modded 1.8 servers. 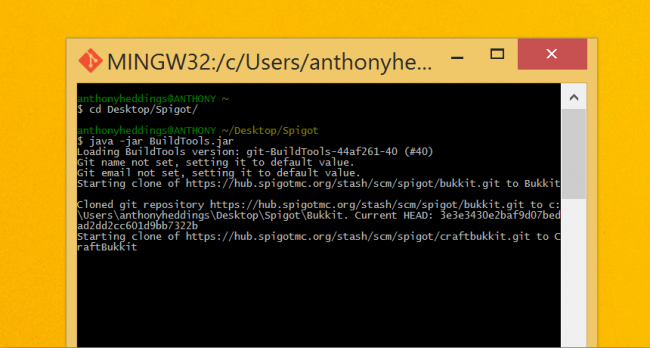 Spigot does not have a download; it must be compiled from source. The Spigot Team automate this with a program called BuildTools. You can download the latest version of BuildTools here. You will also need Git for Windows. Make sure you have the latest version of Java. Run the Git for Windows setup and wait patiently until the progress bar reaches the end. If you’re only running this server for a few people, or for yourself on the same machine, 1gb of RAM will do just fine, but if you want you can change the -Xmx argument to a higher amount. You need op permission to use a lot of in-game commands like giving items or switching to creative mode. There are also plugins that can give users permission to use specific commands. 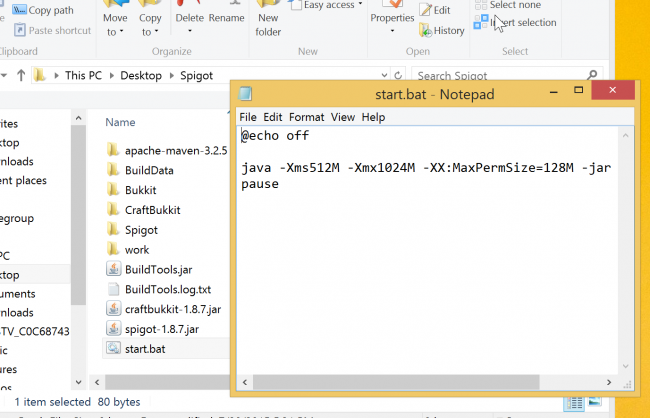 Download the same BuildTools jar from the Windows installation and put it in its own folder. If you want to play with friends outside of your local network, you need to forward ports on your router. Minecraft’s port defaults to 25565, though this can be changed in the server.properties config file. You can get plugins from Bukkit or SpigotMC. Many of the plugins are for 1.7, but most will work with 1.8. Installing a plugin is as easy as downloading a jar file and putting it in the plugins folder. You then need to reload or restart the server for the new plugin to kick in. 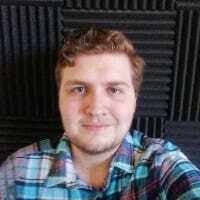 LANBroadcaster opens your server to your local network, so friends can connect without typing in an IP. Multiverse allows you to have as many Minecraft worlds as you want, and Multiverse Portals lets you link them together easily. WorldEdit provides powerful control over terrain and building. WorldGuard protects your builds from players and the environment. Each of these plugins have their own syntax which you can learn by running /help in-game.